Duke is at least fourteen years old and for a large dog, this places him well into the geriatric range. This is the part of his life that should be spent relaxing in the morning light, eating his favorite treats, getting petted whenever he wants, and given all that an older gentleman would deserve in his golden years. Over the years, Duke has served his family and performed his duties well: barking to alert us of strangers, providing unflagging loyalty and companionship, and ensuring that all young ones (whether human or animal) were kept safe from bullying and other dangers. However, instead of spending last week relaxing, Duke was ferociously attacked by another dog. When I came home from work I became concerned that, considering his age and the extent of his injuries, we could possibly lose Duke. During the time when I was the most worried, the thoughts of never seeing Duke ever again entered my mind. Would his “energy” or “life force” simply extinguish if he died? Does he have a spirit or a soul that animates him? What special thing is it that makes Duke, well, Duke? Those were difficult questions to answer, but luckily the simple act of attempting to answer these existential questions provided a certain amount of relief for my worried mind. Getting back to the attack that occurred, let’s discuss the concrete things that certainly helped give Duke a chance during this emergency. The first thing that we did after separating the animals was to reach for the pet first aid kit. 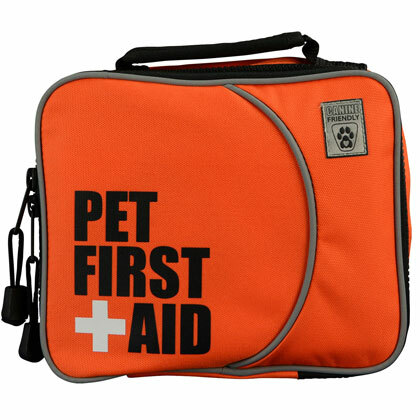 The Canine Friendly Pet First Aid Kit is designed to help you and your pet in an emergency until a veterinarian can be reached. This kit includes disposable gloves, antiseptic wipes, gauze, scissors, an emergency blanket, and many more supplies. It also includes a pet first aid manual to give you a basic knowledge of first aid for pets. All of these key first aid items are held in a durable, zippered bag outlined with reflective piping, so you can see it in low-light situations. This kit can be kept at home or even in the car during times when the pet is going along with you. Another good thing to have during an emergency is the Super Clot Fast-Acting Clotting Gel for Pets. 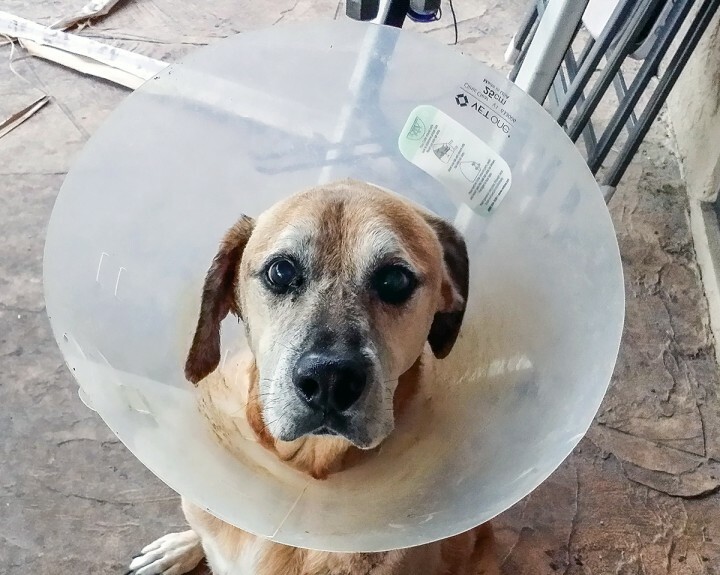 Although initially, Duke’s injuries were too deep to simply place a clotting gel on, after we got him home from the veterinarian visit there were a few cuts and scrapes that benefited from the application of a mild clotting gel. This gel works by not only stopping the bleeding from superficial wounds, it also has disinfectant properties as well as pain numbing properties. Another great item to have around the house is the Miracle Care Liquid Bandage Spray for Dogs and Cats. This product instantly protects the pet’s superficial wounds by creating a waterproof seal which prevents water, along with dirt, debris and germs from entering your pet’s wounds, reducing the risk of infection. The reason I like this product the most and was the greatest help in Duke’s case is that it contains a bitter-tasting ingredient that deters the pet from chewing or licking at his or her wound. This combination of effects helps speed up the healing process. Luckily for us, we did not have to put Sir Edward Tylor’s theory to the test since Duke survived his injuries and is well on the road to recovery now. During the next couple of weeks he will have to be watched closely and given the antibiotics as prescribed to prevent an infection from occurring. The veterinarian also prescribed a few days of a corticosteroid called prednisone to decrease stress and inflammation, as well as the pain medication Tramadol. During an injury like this, being in extreme untreated pain stresses the individual which tends to further delay healing, so pain control is essential. These small things that we now have to do are nothing compared to the joy of having our Duke back. As always, if your pet is injured or if you have any concerns about your pets, getting help from a veterinarian is the best way to get a proper diagnosis and the required treatment. Sometimes wounds that seem superficial and insignificant could have a counterpart injury on the inside of the pet such as bleeding or other internal damage. After you seek the emergency veterinary care don’t forget that if you have any medication related questions, your 1800Petmeds Pharmacist is also available to answer those for you.